When I first developed an affection for the automobile, I was absolutely obsessed with Ford’s Mustang. When I was a senior in High School we hauled this 1968 GT Fastback home for me to wrench on. I spent a lot of the next few years carefully disassembling the car and preparing it for restoration. Somehow my fool mind thought I could afford a bare-metal ground up on this car on a college-kid-delivering-Chinese-food salary. 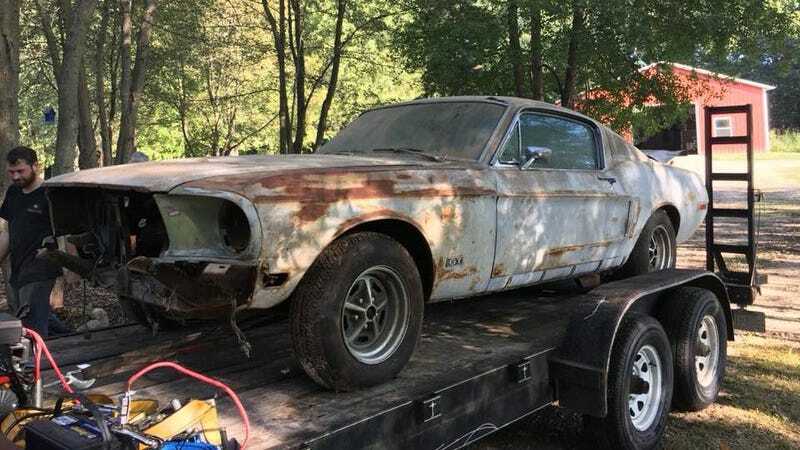 At some point, the project stalled and it was rolled out of the shop and into the barn out back. After college I moved out of state and the car has slowly been eating away at me for years. I have too many project cars and not enough time to finish them all. If I were to devote the kind of time, effort, and money to this car that it needs to be nice again, my other cars would fall apart around me. I’ve been working up to this idea for years, and I was in the right frame of mind to sell when my little brother mentioned he wanted a project car. Scott Brownell is also a Mustang-head, and within a week we’d hammered out a deal. I feel awful that I neglected this awesome car for so long, and that I never got around to so much as getting its small block running again. It’s a solid car, and I think Scott is the right guy for the project because he’ll do things right, where I would probably have half-assed them. It would have been easy to let the car continue to sit, and I could easily have gone on thinking “I’ll get to it someday” but what is easy isn’t always right, and what is right isn’t always easy. So let’s hear your stories. For better or worse, have you given up on a project that still haunts you? Did it go to someone you think will do it justice, or is it destined for the scrappers? Does anyone want this 1976 Toyota Pickup in my back yard that I’m never going to get around to turning into a mini-truck?